Test JIG 3210 is a device used to help diagnose problems in mobile phones. Its main purpose is to make the phone function normally outside of its case, so we can test & check all the voltages & test points. Without one, usually repairers have to guess what part is incorrect, as it is difficult to get access to the PCB with the battery connected & also the interface to the PC. Test JIG 3310, 3330, 3350 is a device used to help diagnose problems in mobile phones. Its main purpose is to make the phone function normally outside of its case, so we can test & check all the voltages & test points. Without one, usually repairers have to guess what part is incorrect, as it is difficult to get access to the PCB with the battery connected & also the interface to the PC. 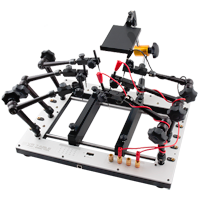 Test JIG 8210/8250 is a device used to help diagnose problems in mobile phones. Its main purpose is to make the phone function normally outside of its case, so we can test & check all the voltages & test points. Test JIG ERIC T20/T28/T29 is a device used to help diagnose problems in mobile phones. Its main purpose is to make the phone function normally outside of its case, so we can test & check all the voltages & test points. Test JIG ERIC T68 is a device used to help diagnose problems in mobile phones. Its main purpose is to make the phone function normally outside of its case, so we can test & check all the voltages & test points. Without one, usually repairers have to guess what part is incorrect, as it is difficult to get access to the PCB with the battery connected & also the interface to the PC. Test JIG NKI 3650 is a device used to help diagnose problems in mobile phones. Its main purpose is to make the phone function normally outside of its case, so we can test & check all the voltages & test points. Without one, usually repairers have to guess what part is incorrect, as it is difficult to get access to the PCB with the battery connected & also the interface to the PC. Test JIG NKI 6100 is a device used to help diagnose problems in mobile phones. Its main purpose is to make the phone function normally outside of its case, so we can test & check all the voltages & test points. Without one, usually repairers have to guess what part is incorrect, as it is difficult to get access to the PCB with the battery connected & also the interface to the PC. Test JIG NKI 6610/7210 is a device used to help diagnose problems in mobile phones. Its main purpose is to make the phone function normally outside of its case, so we can test & check all the voltages & test points. Without one, usually repairers have to guess what part is incorrect, as it is difficult to get access to the PCB with the battery connected & also the interface to the PC. Test JIG NKI 7650 is a device used to help diagnose problems in mobile phones. Its main purpose is to make the phone function normally outside of its case, so we can test & check all the voltages & test points. Without one, usually repairers have to guess what part is incorrect, as it is difficult to get access to the PCB with the battery connected & also the interface to the PC. Test JIG NKI 8310 is a device used to help diagnose problems in mobile phones. Its main purpose is to make the phone function normally outside of its case, so we can test & check all the voltages & test points. Without one, usually repairers have to guess what part is incorrect, as it is difficult to get access to the PCB with the battery connected & also the interface to the PC.